Safe Sound Personal Speakers (SSPS-1) by Safe Sound Sports are designed for use with your iPod and MP3 or just about any other audio source. Safe Sound Personal Speakers can be worn as a lanyard, hanging around the neck which is great for guys who like to exercise with their shirt off. The SSPS-1 can also be clipped to the front of your shirt or for the best sound quality, separated and clipped to your collar near your ears. The SSPS-1 use polypropylene speaker cones so they are water resistant. Smart Technology? 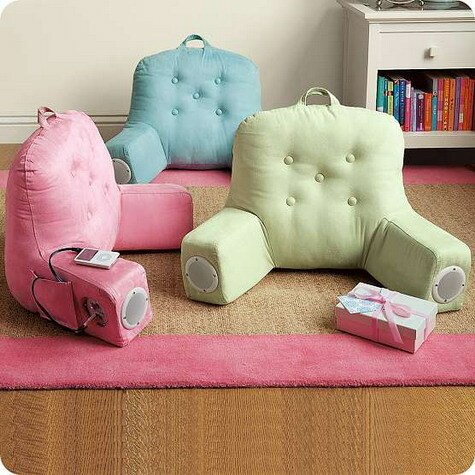 With two embedded speakers and a built-in control panel, this supersoft microsuede pillow is fully wired for sound. Just connect your iPod? and you’re ready to rock. Tufted pillow also comes with a useful pocket and handle. 31 x 17 x 19″ h.